Mr. Verloc, going out in the morning, left his shop nominally in charge of his brother-in-law. "Like to like. The terrorist and the policeman both come from the same basket." No man engaged in a work he does not like can preserve many saving illusions about himself. The distaste, the absence of glamour, extend from the occupation to the personality. It is only when our appointed activities seem by a lucky accident to obey the particular earnestness of our temperament that we can taste the comfort of complete self-deception. "But there are more kinds of fools than one can guard against. You can't expect a detonator to be absolutely fool-proof." Nobody looked at him. He passed on unsuspected and deadly, like a pest in the street full of men. After the terrorist attacks of 9/11, Joseph Conrad's novel of a century earlier was apparently widely read again, especially in Western intelligence circles. I'm not sure, though, what those new readers might have got from it. 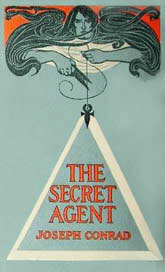 The plot of The Secret Agent concerns a bombing conspiracy in London, England in the 1880s. But the suspects are local, self-styled anarchists—more like the homegrown terrorists of the 1995 Oklahoma bombing, or the recent Boston marathon events, than the jihadists of 2001. It makes sense that the American pipe-bomb mailer known as the Unabomber was reportedly a rabid fan of Conrad's novel and identified strongly with one of its scarier characters. However, something that's overlooked by many who comment on the book's continued relevance is that the main character carrying out the bombing is not motivated by any anarchist, socialist, libertarian or religious cause. Rather, he acts for a foreign diplomat who wants to discredit the revolutionaries and provoke England into cracking down on its malcontents. Many a reader drawn to the novel by the title, expecting a James Bond-style hero, is doubtlessly disappointed to find the "secret agent" is a secret agent provocateur. And the rest of the bad guys are rather ineffectual dreamers. The idea of a character who lives a double life among radicals is picked up again by Conrad in Under Western Eyes. As in the later novel, the author of The Secret Agent is ambivalent about where his sympathies lie. The anarchists, the politicians, the police and the innocent bystanders are all drawn as flawed characters. Some are more appealing than others, some are sleazier or more manipulative than others—but they are all shown in Conrad's patented objective style. We get their appearances, their actions, their words and sometimes their thoughts and we can draw our own conclusions. Conrad goes out of his way to appear fair. This is one of his few works in which the story is not discerned through layers of unreliable narrators. It's laid out from an authorial god's-eye view, switching focus from character to character, cataloguing their outward behaviours and dipping in and out of their minds. Sometimes important information is held back from the reader, in order to create a greater effect when a character uncovers it. Several key plot points, such as the actual bombing, occur off stage so we learn vital particulars only gradually and indirectly, letting us understand some characters' seemingly odd behaviour only in retrospect. In Under Western Eyes—Conrad's other "political" novel—the writer keeps slipping into a Dostoyevskyan tone of near-hysteria. But at this point, in The Secret Agent, the writing is closer to that of Tolstoy: calm, clear, and observant of the small movements of ordinary life. And it gives the idea that this novel is a genre work or, as has been stated baldly, that The Secret Agent is an early example of the espionage thriller genre. I'd rather reserve that honour for Esrkine Childers' The Riddle of the Sands (1903) or John Buchan's The Thirty-Nine Steps (1915), plot-driven adventures without nearly the depth or density of Conrad's novel. If we have to continue playing the comparison game, I might allow parallels be drawn between The Secret Agent and some of the more important espionage writing of John le Carré. Both are complex, morally challenging, and brilliant at entwining the personal and the political—at finding the intersection of mundane, banal daily life with the significant issues of their times. Conrad's better. He's better at delving into the wider human condition. I don't think le Carré would resent anyone saying this. But if you want to understand 9/11 or any other of the great and terrible movements of recent decades, I think you're better off reading le Carré.